What if the freedom of speech is why we still have bullying? It might be because people have the right to make fun of people for no reason other than they think it’s funny. I have been picked on unfairly for 3 years of my life, Kindergarten through 3rd grade. I don’t really like thinking of the past because I can’t change it. Essentially I was shoved around a lot and called names like “giraffe,” I mean really? Giraffe’s aren’t actually tall, they just have long necks, and I do not have a long neck... I think, :). All we want is to keep freedom of speech. Something we need to take care of is the mean things people say just to push up their own self-esteems by pushing someone else’s lower. It depends on how parents raise their kids. Bullies could raise bullies, or some people spoil their kids. Is the solution over the top punishments? No. Parents should keep their kids in check, so they aren’t ugly-hearted and mean. We want to keep the freedom of speech, not keep the freedom to say whatever in order to be mean. Group 7 Created with Sketch Beta. Group 7 Created with Sketch Beta. My writing is about how other people of different cultures can do the same thing we do and that they are not they are not to different. Race is just a color. My American creed is doing whatever you want no matter what language you speak, what race you are, or even what country you came from. I also think that my American creed is freedom for everyone. 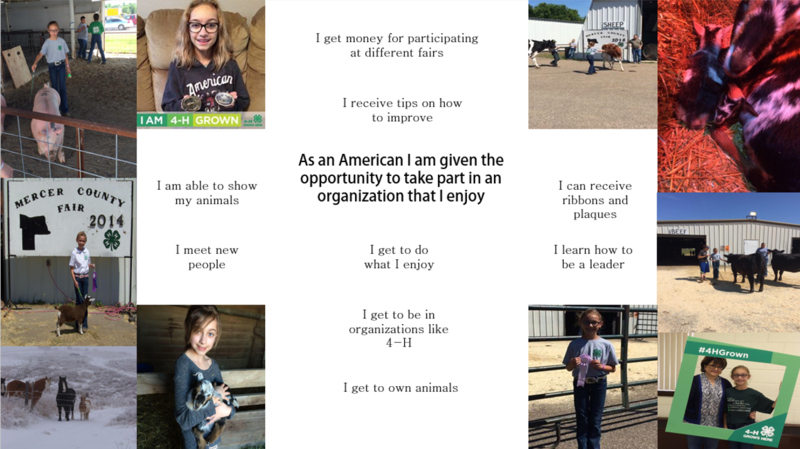 4-H is very important to me, and as an American I am able to be in 4-H and many other organizations. This is about soldiers! 'Merica! My thought about what America is becoming. Some things that I think America did wrong. We need better. We want better. We need to stop allowing political parties divide us. This essay is about what American creed means to me. What Words, Symbols, and Rituals Express the American Creed? I'm writing about what words like free and opportunity mean express what we are and what we have. I talk about the people the way they are treating the american flag. And what things bring us together as one nation. This is a story about the American Creed. Twin girls are on a talk show and being interviewed by, the host, Bobby Smith on how they feel about the American Creed. This video contains an interview with my grandmother about her experiences with World War II and the Vietnam War. My piece is about what America is about, and what we can do to make it better. We might not agree on everything, even if it's with our own family. However, we can and should understand what people of other views than us think. But, a lot of the times we don't. We need to fix that. American should not threaten to ban weapons. We interviewed two people on their American past. 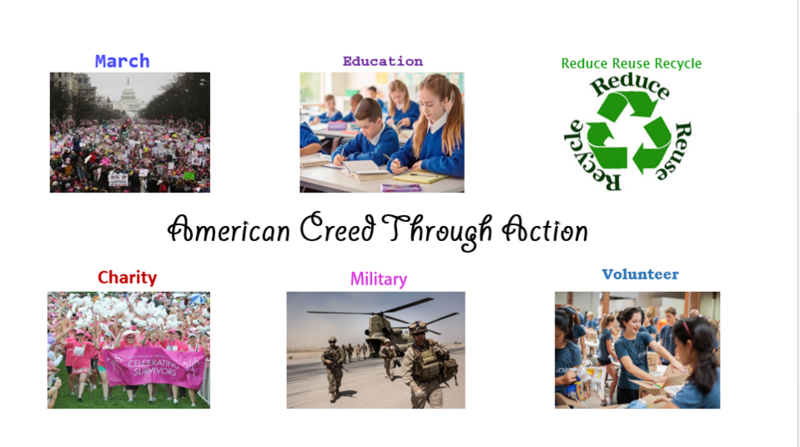 This is about the many ways people show their American Creed through actions. I wrote about how coal gives the energy to the power plants that gives us our electricity. This is an essay that describes how words, symbols, and rituals really express our American Creed. Makenna B. and Isabella N.
More letters about "bullying", "freedom", and "speech"
A short depiction of what America is really like. What people think of America and the truth about America can be totally different. It is not the greatest and sometimes its not united. Its a madjusted system. What I think the American Dream truly is. In this piece, I talk about what it means to be American and providing evidence and reasoning to back up my claim. This is a piece by a high school student on the core American Values and what his views are on the subject. And it shows how the values affect people, and what experiences have led to the values. The "Land of the Free" has the highest incarceration rate in the world. The US can become a much better place by rehabilitating drug addicts and potentially other nonviolent offenders. I chose an image of Oprah to represent the American Creed because she has been a very impactful person on America. 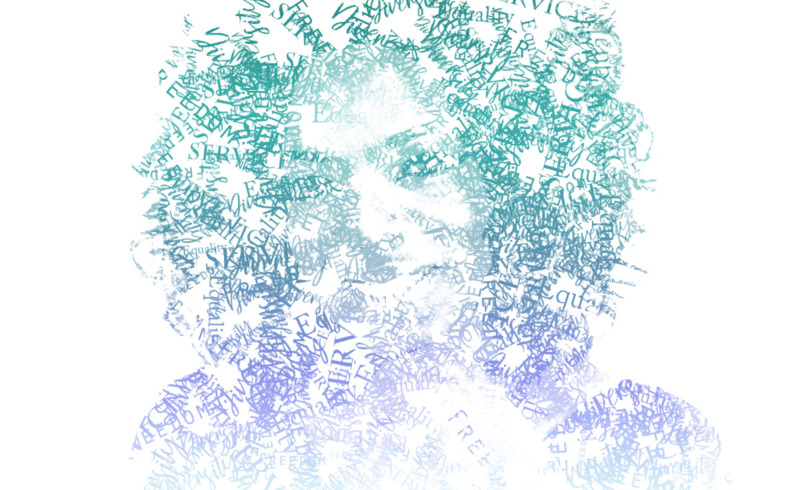 The words I used were, Freedom, Equality, Service and Diversity. Some people come from places where their voices will not be heard. This is about a girl who seeks freedom similar to how it is in the United States. I wrote this poem to show the good and the bad in America. I wanted to highlight the good things about our country but I also draw awareness to the bad things to encourage people to make a change. 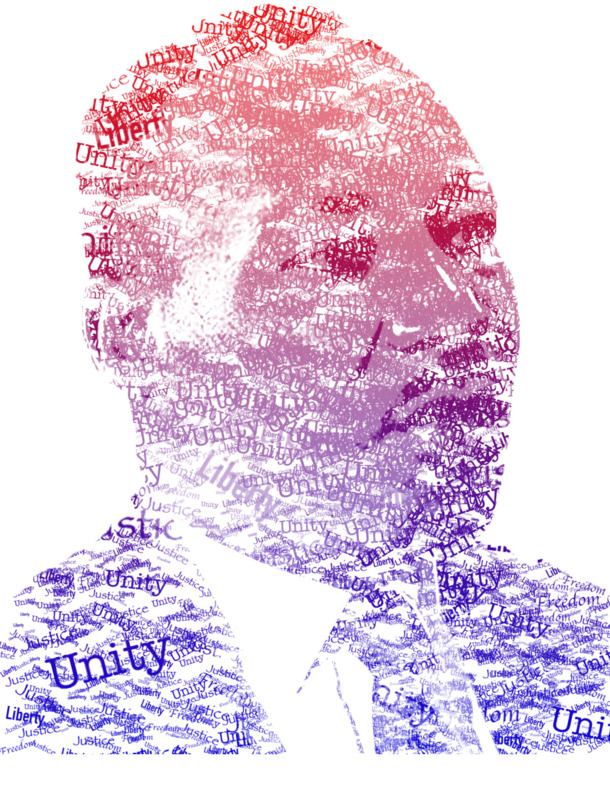 My masking assignment is over Martin Luther King Jr. I will continue to look up to his bravery. He understood the importance of diversity and freedom for all. This man not only stood up for what he believed in but also made a difference in history.